"Dragon 1" redirects here. For the Dragon 1 airplane by de Havilland, see de Havilland Dragon. Dragon is a reusable cargo spacecraft developed by SpaceX, an American private space transportation company. Dragon is launched into orbit by the company's Falcon 9 two-stage-to-orbit launch vehicle. The SpaceX Dragon CRS variant approaching the ISS during the C2+ mission in May 2012. During its maiden flight in December 2010, Dragon became the first commercially built and operated spacecraft to be recovered successfully from orbit. 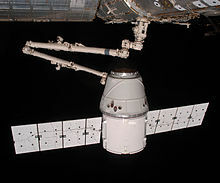 On 25 May 2012, a cargo variant of Dragon became the first commercial spacecraft to successfully rendezvous with and attach to the International Space Station (ISS). SpaceX is contracted to deliver cargo to the ISS under NASA's Commercial Resupply Services program, and Dragon began regular cargo flights in October 2012. With the Dragon spacecraft and the Orbital ATK Cygnus, NASA seeks to increase its partnerships with domestic commercial aviation and aeronautics industry. On 3 June 2017, the CRS-11 capsule, largely assembled from previously flown components from the CRS-4 mission in September 2014, was launched again for the first time, with the hull, structural elements, thrusters, harnesses, propellant tanks, plumbing and many of the avionics reused while the heat shield, batteries and components exposed to sea water upon splashdown for recovery were replaced. SpaceX has developed a second version called Dragon 2, which includes the capability to transport people. Flight testing is scheduled to complete in the first half of 2019 with the first flight of astronauts, on a mission contracted to NASA, scheduled to occur later the same year. SpaceX's CEO, Elon Musk, named the spacecraft after the 1963 song "Puff, the Magic Dragon" by Peter, Paul and Mary, reportedly as a response to critics who considered his spaceflight projects impossible. SpaceX began developing the Dragon spacecraft in late 2004, making a public announcement in 2006 with a plan of entering service in 2009. Also in 2006, SpaceX won a contract to use the Dragon spacecraft for commercially supplied resupply services to the International Space Station for the American federal space agency, NASA. In 2005, NASA solicited proposals for a commercial ISS resupply cargo vehicle to replace the then-soon-to-be-retired Space Shuttle, through its Commercial Orbital Transportation Services (COTS) development program. The Dragon spacecraft was a part of SpaceX's proposal, submitted to NASA in March 2006. SpaceX's COTS proposal was issued as part of a team, which also included MD Robotics, the Canadian company that had built the ISS's Canadarm2. On 18 August 2006, NASA announced that SpaceX had been chosen, along with Kistler Aerospace, to develop cargo launch services for the ISS. The initial plan called for three demonstration flights of SpaceX's Dragon spacecraft to be conducted between 2008 and 2010. SpaceX and Kistler were to receive up to $278 million and $207 million respectively, if they met all NASA milestones, but Kistler failed to meet its obligations, and its contract was terminated in 2007. NASA later re-awarded Kistler's contract to Orbital Sciences. On 23 December 2008, NASA awarded a $1.6 billion Commercial Resupply Services (CRS) contract to SpaceX, with contract options that could potentially increase the maximum contract value to $3.1 billion. The contract called for 12 flights, with an overall minimum of 20,000 kg (44,000 lb) of cargo to be carried to the ISS. On 23 February 2009, SpaceX announced that its chosen phenolic-impregnated carbon ablator heat shield material, PICA-X, had passed heat stress tests in preparation for Dragon's maiden launch. The primary proximity-operations sensor for the Dragon spacecraft, the DragonEye, was tested in early 2009 during the STS-127 mission, when it was mounted near the docking port of the Space Shuttle Endeavour and used while the Shuttle approached the International Space Station. The DragonEye's Lidar and thermography (thermal imaging) abilities were both tested successfully. The COTS UHF Communication Unit (CUCU) and Crew Command Panel (CCP) were delivered to the ISS during the late 2009 STS-129 mission. The CUCU allows the ISS to communicate with Dragon and the CCP allows ISS crew members to issue basic commands to Dragon. In summer 2009, SpaceX hired former NASA astronaut Ken Bowersox as vice president of their new Astronaut Safety and Mission Assurance Department, in preparation for crews using the spacecraft. As a condition of the NASA CRS contract, SpaceX analyzed the orbital radiation environment on all Dragon systems, and how the spacecraft would respond to spurious radiation events. That analysis and the Dragon design – which uses an overall fault-tolerant triple-redundant computer architecture, rather than individual radiation hardening of each computer processor – was reviewed by independent experts before being approved by NASA for the cargo flights. During March, 2015, it was announced that SpaceX had been awarded an additional three missions under Commercial Resupply Services Phase 1. These additional missions are SpaceX CRS-13, SpaceX CRS-14 and SpaceX CRS-15 and would cover the cargo needs of 2017. On 24 February 2016, SpaceNews disclosed that SpaceX had been awarded a further five missions under Commercial Resupply Services Phase 1. This additional tranche of missions had SpaceX CRS-16 and SpaceX CRS-17 manifested for FY2017 while SpaceX CRS-18, SpaceX CRS-19 and SpaceX CRS-20 and were notionally manifested for FY2018. The Commercial Resupply Services 2 (CRS2) contract definition/solicitation period commenced in 2014 and a result announced on 14 January 2016. The CRS2 launches are expected to commence in 2019, and extend to at least 2024. On 14 January 2016, NASA announced that three companies had been awarded contracts for a minimum of six launches each. SpaceX, Orbital ATK and Sierra Nevada Corporation won contracts. The maximum potential value of all the contracts was indicated to be $14Bn but the minimum requirements would be considerably less. No further financial information was disclosed. The missions involved would be from late 2019 through to 2024. Interior of the COTS 2 Dragon capsule. Recovery of the COTS 2 Dragon capsule on 31 May 2012. The first flight of the Falcon 9, a private flight, occurred in June 2010 and launched a stripped-down version of the Dragon capsule. This Dragon Spacecraft Qualification Unit had initially been used as a ground test bed to validate several of the capsule's systems. During the flight, the unit's primary mission was to relay aerodynamic data captured during the ascent. It was not designed to survive re-entry, and did not. NASA contracted for three test flights from SpaceX, but later reduced that number to two. The first Dragon spacecraft launched on its first mission – contracted to NASA as COTS Demo Flight 1 – on 8 December 2010, and was successfully recovered following re-entry to Earth's atmosphere. The mission also marked the second flight of the Falcon 9 launch vehicle. The DragonEye sensor flew again on STS-133 in February 2011 for further on-orbit testing. In November 2010, the Federal Aviation Administration (FAA) had issued a re-entry license for the Dragon capsule, the first such license ever awarded to a commercial vehicle. The second Dragon flight, also contracted to NASA as a demonstration mission, launched successfully on 22 May 2012, after NASA had approved SpaceX's proposal to combine the COTS 2 and 3 mission objectives into a single Falcon 9/Dragon flight, renamed COTS 2+. Dragon conducted orbital tests of its navigation systems and abort procedures, before being grappled by the ISS' Canadarm2 and successfully berthing with the station on 25 May to offload its cargo. Dragon returned to Earth on 31 May 2012, landing as scheduled in the Pacific Ocean, and was again successfully recovered. On 23 August 2012, NASA Administrator Charles Bolden announced that SpaceX had completed all required milestones under the COTS contract, and was cleared to begin operational resupply missions to the ISS. Dragon spacecrafts can return to Earth 3,500 kg (7,700 lb), which can be all unpressurized disposal mass or up to 3,000 kg (6,600 lb) of return pressurized cargo from the ISS, and is the only current spacecraft capable of returning to Earth with a significant amount of cargo. Other than the Russian Soyuz crew capsule, Dragon is the only currently operating spacecraft designed to survive re-entry. Because Dragon allows for the return of critical materials to researchers in as little as 48 hours from splashdown, it opens the possibility of new experiments on ISS that can produce materials for later analysis on ground using more sophisticated instrumentation. For example, CRS-12 returned mice that have spent time in orbit which will help give insight into how microgravity impacts blood vessels in both the brain and eyes, and in determining how arthritis develops. Dragon was launched on its first operational CRS flight on 8 October 2012, and completed the mission successfully on 28 October. NASA initially contracted SpaceX for 12 operational missions, and later extended the CRS contract with 8 more flights, bringing the total to 20 launches until 2019. In 2016, a new batch of 6 missions under the CRS2 contract was assigned to SpaceX; those missions are scheduled to be launched between 2020 and 2024. SpaceX CRS-11, SpaceX's eleventh CRS mission, was successfully launched on June 3, 2017 from Kennedy Space Center LC-39A, being the 100th mission to be launched from that pad. This mission was the first to re-fly a recovered Dragon capsule that previously flew on CRS-4 mission. This mission delivered 2,708 kilograms of cargo to the International Space Station, including NICER. The first stage of the Falcon 9 launch vehicle landed successfully at Landing Zone 1. This mission launched for the first time a refurbished Dragon capsule, serial number C106, which had flown in September 2014 on the CRS-4 mission, and was the first time since 2011 a reused spacecraft arrived at the ISS. Gemini SC-2 capsule is the only other reused capsule, but it was only reflown suborbitally in 1966. SpaceX CRS-12, SpaceX's twelfth CRS mission, was successfully launched on the first 'Block 4' version of the Falcon 9 on August 14, 2017 from Kennedy Space Center LC-39A at the first attempt. This mission delivered 2,349 kg (5,179 lb) of pressurized mass and 961 kg (2,119 lb) unpressurized. The external payload manifested for this flight was the CREAM cosmic-ray detector. Last flight of a newly-built Dragon capsule; further missions will use refurbished spacecraft. SpaceX CRS-13, SpaceX's thirteenth CRS mission, was the second use of a previously-flown Dragon capsule, but the first time in concordance with a reused first-stage booster. It was successfully launched on December 15, 2017 from Cape Canaveral Air Force Station Space Launch Complex 40 at the first attempt. This was the first launch from SLC-40 since the Amos-6 pad anomaly. The booster was the previously-flown core from the CRS-11 mission. This mission delivered 1,560 kg (3,439 lb) of pressurized mass and 645 kg (1,422 lb) unpressurized. It returned from orbit and splashed down on January 13, 2018, making it the first space capsule to be reflown to orbit more than once. SpaceX CRS-14, SpaceX's fourteenth CRS mission, was the third reuse of a previously-flown Dragon capsule. It was successfully launched on April 2, 2018 from Cape Canaveral Air Force Station Space Launch Complex 40. It successfully docked with the ISS on April 4, 2018 and remained docked for a month before returning cargo and science experiments back to earth. SpaceX CRS-15, successfully launched on June 29, 2018, was the fourth reuse. In 2006, Elon Musk stated that SpaceX had built "a prototype flight crew capsule, including a thoroughly tested 30-man-day life-support system". A video simulation of the launch escape system's operation was released in January 2011. Musk stated in 2010 that the developmental cost of a crewed Dragon and Falcon 9 would be between $800 million and $1 billion. In 2009 and 2010, Musk suggested on several occasions that plans for a crewed variant of the Dragon were proceeding and had a two-to-three-year timeline to completion. SpaceX submitted a bid for the third phase of CCDev, CCiCap. SpaceX was not awarded funding during the first phase of NASA's Commercial Crew Development (CCDev) milestone-based program. However, the company was selected on 18 April 2011, during the second phase of the program, to receive an award valued at $75 million to help develop its crew system. Their CCDev2 milestones involved the further advancement of the Falcon 9/Dragon crew transportation design, the advancement of the Launch Abort System propulsion design, completion of two crew accommodations demos, full-duration test firings of the launch abort engines, and demonstrations of their throttle capability. SpaceX's launch abort system received preliminary design approval from NASA in October 2011. In December 2011, SpaceX performed its first crew accommodations test; the second such test is expected to involve spacesuit simulators and a higher-fidelity crewed Dragon mock-up. In January 2012, SpaceX successfully conducted full-duration tests of its SuperDraco landing/escape rocket engine at its Rocket Development Facility in McGregor, Texas. On 3 August 2012, NASA announced the award of $440 million to SpaceX for the continuation of work on the Dragon under CCiCap. On 20 December 2013, SpaceX completed a parachute drop test to validate the new parachute design. This involved carrying a 5,400 kilograms (12,000 lb) Dragon test article by helicopter to an altitude of 2,400 meters (8,000 ft) above the Pacific Ocean. The test article was released and intentionally forced into a tumble. Dragon then released its two drogue parachutes, followed by its three main parachutes and splashed down into the ocean. The test article was then retrieved by helicopter and returned to shore. On 6 May 2015, SpaceX completed a pad abort test for the Dragon 2. During this test, the Dragon used its abort engines to launch away from a test stand at Launch Complex 40. It traveled to an altitude of 1,187 meters (3,894 ft), separated from its trunk, deployed its drogue parachutes and then the main parachutes. It splashed down into the ocean and was recovered. The vehicle was planned to reach an altitude of 1,500 meters (5,000 ft) but one of the engines underperformed due to an abnormal fuel mixture ratio. In a planned in-flight abort test, Dragon will use its launch abort engines to escape from a Falcon 9 first stage in flight. The launch is planned to occur from SLC-40. This test will occur at the point of worst-case dynamic loads, which is also when Dragon has the smallest performance margin for separation from its launch vehicle. The Falcon 9 planned to be used will be a regular first stage and will have no second stage. An uncrewed test mission to the ISS, SpX-DM1, was launched in March 2019. The first Dragon V2 docked on ISS on March 3, 2019. It has successfully performed the undocking, deorbit and splashdown in the Atlantic Ocean on March 8, 2019. It will carry some payload down from the Station. A crewed test mission to the ISS, SpX-DM2, is planned to be launched in July 2019 and last for 14 days. In 2014, SpaceX released the total combined development costs for both the Falcon 9 launch vehicle and the Dragon capsule. NASA provided US$396 million while SpaceX provided over US$450 million to fund both development efforts. A Dragon capsule being shipped out of SpaceX HQ in Hawthorne, California, February 2015. In December 2010, the SpaceX production line was reported to be manufacturing one new Dragon spacecraft and Falcon 9 rocket every three months. Elon Musk stated in a 2010 interview that he planned to increase production turnover to one Dragon every six weeks by 2012. Composite materials are extensively used in the spacecraft's manufacture to reduce weight and improve structural strength. By September 2013, SpaceX total manufacturing space had increased to nearly 1,000,000 square feet (93,000 m2) and the factory had six Dragons in various stages of production. SpaceX published a photograph showing the six, including the next four NASA Commercial Resupply Services (CRS) mission Dragons (CRS-3, CRS-4, CRS-5, CRS-6) plus the drop-test Dragon, and the pad-abort Dragon weldment for commercial crew. The Dragon spacecraft consists of a nose-cone cap that jettisons after launch, a conventional blunt-cone ballistic capsule, and an unpressurized cargo-carrier trunk equipped with two solar arrays. The capsule uses a PICA-X heat shield, based on a proprietary variant of NASA's Phenolic impregnated carbon ablator (PICA) material, designed to protect the capsule during Earth atmospheric entry, even at high return velocities from Lunar and Martian missions. The Dragon capsule is re-usable, and can fly multiple missions. The trunk is not recoverable; it separates from the capsule before re-entry and burns up in Earth's atmosphere. 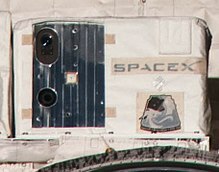 The trunk section, which carries the spacecraft's solar panels and allows the transport of unpressurized cargo to the ISS, was first used for cargo on the SpaceX CRS-2 mission. The spacecraft is launched atop a Falcon 9 booster. The Dragon capsule is equipped with 18 Draco thrusters. During its initial cargo and crew flights, the Dragon capsule will land in the Pacific Ocean and be returned to the shore by ship. For the ISS Dragon cargo flights, the ISS's Canadarm2 grapples its Flight-Releasable Grapple Fixture and berths Dragon to the station's US Orbital Segment using a Common Berthing Mechanism. The CRS Dragon does not have an independent means of maintaining a breathable atmosphere for astronauts and instead circulates in fresh air from the ISS. For typical missions, Dragon is planned to remain berthed to the ISS for about 30 days. The CRS Dragon's capsule can transport 3,310 kg (7,300 lb) of cargo, which can be all pressurized, all unpressurized, or anywhere between. It can return to Earth 3,310 kg (7,300 lb), which can be all unpressurized disposal mass, or up to 2,500 kg of return pressurized cargo, driven by parachute limitations. There is a volume constraint of 14 m3 (490 cu ft) trunk unpressurized cargo and 11.2 m3 (400 cu ft) of pressurized cargo (up or down). The trunk was first used operationally on the Dragon's CRS-2 mission in March 2013. Its solar arrays produce a peak power of 4 kW. The CRS Dragon design was modified beginning with the fifth Dragon flight on the SpaceX CRS-3 mission to the ISS in March 2014. While the outer mold line of the Dragon was unchanged, the avionics and cargo racks were redesigned to supply substantially more electrical power to powered cargo devices, including the GLACIER and MERLIN freezer modules for transporting critical science payloads. When used for non-NASA, non-ISS commercial flights, the uncrewed version of the Dragon spacecraft is called DragonLab. It is reusable and free-flying and can carry pressurized and unpressurized payloads. Its subsystems include propulsion, power, thermal and environmental control, avionics, communications, thermal protection, flight software, guidance and navigation systems, and entry, descent, landing, and recovery gear. It has a total combined upmass of 6,000 kilograms (13,000 lb) upon launch, and a maximum downmass of 3,000 kilograms (6,600 lb) when returning to Earth. In November 2014 there were two DragonLab missions listed on the SpaceX launch manifest: one in 2016 and another in 2018. However, these missions were removed from the manifest in early 2017, with no official SpaceX statement. The American Biosatellites once performed similar uncrewed payload-delivery functions, and the Russian Bion satellites still continue to do so. A successor of Dragon called Dragon 2 has been developed by SpaceX, designed to carry passengers and crew. It will be able to carry up to seven astronauts, or some mix of crew and cargo, to and from low Earth orbit. The Dragon 2 heat shield is designed to withstand Earth re-entry velocities from Lunar and Martian spaceflights. SpaceX undertook several U.S. Government contracts to develop the Dragon 2 crewed variant, including a Commercial Crew Development 2 (CCDev 2)-funded Space Act Agreement in April 2011, and a Commercial Crew integrated Capability (CCiCap)-funded space act agreement in August 2014. Red Dragon was a version of the Dragon spacecraft that had been previously proposed to fly farther than Earth orbit and transit to Mars via interplanetary space. In addition to SpaceX's own privately funded plans for an eventual Mars mission, NASA Ames Research Center had developed a concept called Red Dragon: a low-cost Mars mission that would use Falcon Heavy as the launch vehicle and trans-Martian injection vehicle, and the Dragon 2-based capsule to enter the atmosphere of Mars. The concept was originally envisioned for launch in 2018 as a NASA Discovery mission, then alternatively for 2022, but was never formally submitted for funding within NASA. The mission would have been designed to return samples from Mars to Earth at a fraction of the cost of NASA's own sample-return mission, which was projected in 2015 to cost 6 billion dollars. On 27 April 2016, SpaceX announced its plan to go ahead and launch a modified Dragon lander to Mars in 2018. However, Musk canceled the Red Dragon program in July 2017. The modified Red Dragon capsule would have performed all entry, descent and landing (EDL) functions needed to deliver payloads of 1 tonne (2,200 lb) or more to the Martian surface without using a parachute. Preliminary analysis showed that the capsule's atmospheric drag would slow it enough for the final stage of its descent to be within the abilities of its SuperDraco retro-propulsion thrusters. List includes only completed or currently manifested missions. Launch dates are listed in UTC. SpX-9 C111 18 July 2016  Delivered docking adapter IDA-2 to modify the ISS docking port Pressurized Mating Adapter (PMA-2) for Commercial Crew spacecraft. Longest time a Dragon Capsule was in space. The following specifications are published by SpaceX for the non-NASA, non-ISS commercial flights of the refurbished Dragon capsules, listed as "DragonLab" flights on the SpaceX manifest. The specifications for the NASA-contracted Dragon Cargo were not included in the 2009 DragonLab datasheet. 10 m3 (350 cu ft) interior pressurized, environmentally controlled, payload volume. Onboard environment: 10–46 °C (50–115 °F); relative humidity 25~75%; 13.9~14.9 psia air pressure (958.4~1027 hPa). 0.1 m3 (3.5 cu ft) unpressurized payload volume. Sensor bay hatch opens after orbit insertion to allow full sensor access to the outer space environment, and closes before Earth atmosphere re-entry. 14 m3 (490 cu ft) payload volume in the 2.3 m (7 ft 7 in) trunk, aft of the pressure vessel heat shield, with optional trunk extension to 4.3 m (14 ft 1 in) total length, payload volume increases to 34 m3 (1,200 cu ft). Supports sensors and space apertures up to 3.5 m (11 ft 6 in) in diameter. Power: twin solar panels providing 1,500 W average, 4,000 W peak, at 28 and 120 VDC. Spacecraft communications: commercial standard RS-422 and military standard 1553 serial I/O, plus Ethernet communications for IP-addressable standard payload service. Telemetry/data downlink: 300 Mbit/s standard, fault-tolerant S-band telemetry and video transmitters. Dragon uses a "radiation-tolerant" design in the electronic hardware and software that make up its flight computers. The system uses three pairs of computers, each constantly checking on the others, to instantiate a fault-tolerant design. In the event of a radiation upset or soft error, one of the computer pairs will perform a soft reboot. Including the six computers that make up the main flight computers, Dragon employs a total of 18 triple-processor computers. Automated Transfer Vehicle – a retired expendable cargo vehicle used by the ESA in 2008–2014. ^ a b Clark, Stephen (18 May 2012). "Q&A with SpaceX founder and chief designer Elon Musk". SpaceFlightNow. Retrieved 29 June 2012. ^ a b c Bates, Daniel (9 December 2010). "Mission accomplished! SpaceX Dragon becomes the first privately funded spaceship launched into orbit and guided back to Earth". Daily Mail. London. Retrieved 9 December 2010. ^ a b c "SpaceX Launches Private Capsule on Historic Trip to Space Station". Space.com. 22 May 2012. ^ a b c "SpaceX Brochure – 2008" (PDF). Archived from the original (PDF) on 20 March 2012. Retrieved 9 December 2010. ^ a b c d e f g h i j k l m n o "DragonLab datasheet" (PDF). Hawthorne, California: SpaceX. 8 September 2009. Archived from the original (PDF) on 4 January 2011. Retrieved 19 October 2010. ^ Bowersox, Ken (25 January 2011). "SpaceX Today" (PDF). SpaceX. Archived from the original (PDF) on 25 April 2012. Retrieved 13 October 2011. ^ Musk, Elon (17 July 2009). "COTS Status Update & Crew Capabilities" (PDF). SpaceX. Retrieved 16 April 2012. ^ a b "The Annual Compendium of Commercial Space Transportation: 2012" (PDF). Federal Aviation Administration. February 2012. Retrieved 8 February 2013. ^ a b "SpaceX's Dragon captured by ISS, preparing for historic berthing". NASASpaceflight.com. 25 May 2012. ^ Chang, Kenneth (25 May 2012). "Space X Capsule Docks at Space Station". New York Times. Retrieved 25 May 2012. ^ "SpaceX's Dragon Docks With Space Station—A First". National Geographic. 25 May 2012. Retrieved 28 May 2012. ^ a b c "Liftoff! SpaceX Dragon Launches 1st Private Space Station Cargo Mission". Space.com. 8 October 2012. ^ a b "Falcon 9 undergoes pad rehearsal for October launch". Spaceflight Now. 31 August 2012. Retrieved 12 September 2012. ^ a b "Worldwide Launch Schedule". Spaceflight Now. 7 September 2012. Retrieved 12 September 2012. ^ "Press Briefed On the Next Mission to the International Space Station". NASA. 20 March 2012. Retrieved 11 April 2012. 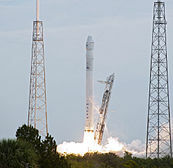 ^ "NASA Taps SpaceX, Orbital Sciences to Haul Cargo to Space Station". Space.com. 23 December 2008. Retrieved 1 March 2011. ^ Mark Carreau (3 June 2017). "SpaceX Advances Space Hardware Reuse With Latest Flight". Aviation Week Network. ^ a b "NASA, Partners Update Commercial Crew Launch Dates". NASA Commercial Crew Program Blog. 6 February 2019. Retrieved 6 February 2019. ^ "5 Fun Facts About Private Rocket Company SpaceX". Space.com. 21 May 2012. Retrieved 26 May 2012. ^ a b Berger, Brian (8 March 2006). "SpaceX building reusable crew capsule". MSNBC. Retrieved 9 December 2010. ^ a b "NASA selects crew, cargo launch partners". Spaceflight Now. 18 August 2006. Archived from the original on 18 December 2011. Retrieved 18 December 2011. ^ Thorn, Valin (11 January 2007). "Commercial Crew & Cargo Program Overview" (PDF). NASA. Retrieved 15 April 2012. ^ a b Boyle, Alan (18 August 2006). "SpaceX, Rocketplane win spaceship contest". MSNBC. New York. Archived from the original on 18 December 2011. Retrieved 18 December 2011. ^ a b Berger, Brian (19 October 2007). "Time Runs out for RpK; New COTS Competition Starts Immediately". Space.com. Archived from the original on 18 December 2011. Retrieved 9 December 2010. ^ Bergin, Chris (19 February 2008). "Orbital beat a dozen competitors to win NASA COTS contract". NASASpaceflight.com. Retrieved 18 December 2011. ^ a b "F9/Dragon Will Replace the Cargo Transport Function of the Space Shuttle after 2010" (Press release). Hawthorne, California: SpaceX. 23 December 2008. Archived from the original on 21 July 2009. Retrieved 26 January 2009. ^ Chaikin, Andrew (January 2012). "1 visionary + 3 launchers + 1,500 employees = ? : Is SpaceX changing the rocket equation?". Air & Space Smithsonian. Archived from the original on 18 December 2011. Retrieved 13 November 2011. ^ "UPDATE: Wednesday, 23 September 2009" (Press release). Hawthorne, California: SpaceX. 23 September 2009. Archived from the original on 18 December 2011. Retrieved 18 December 2011. ^ Update: 23 September 2009. SpaceX.com. Retrieved 9 November 2012. ^ a b Bergin, Chris (28 March 2010). "SpaceX announce successful activation of Dragon's CUCU onboard ISS". NASASpaceflight.com. Retrieved 27 April 2012. ^ "Former astronaut Bowersox Joins SpaceX as vice president of Astronaut Safety and Mission Assurance" (Press release). SpaceX. 18 June 2009. Archived from the original on 18 December 2011. Retrieved 22 December 2012. ^ a b c Svitak, Amy (18 November 2012). "Dragon's "Radiation-Tolerant" Design". Aviation Week. Retrieved 20 August 2015. ^ Bergin, Chris (3 March 2015). "NASA lines up four additional CRS missions for Dragon and Cygnus". NASA SpaceFlight. Retrieved 24 February 2016. ^ de Selding, Peter B. (24 February 2016). "SpaceX wins 5 new space station cargo missions in NASA contract estimated at $700 million". Space News. Retrieved 24 February 2016. ^ "Sierra Nevada Corp. joins SpaceX and Orbital ATK in winning NASA resupply contracts". Washington Post. 14 January 2016. Retrieved 17 January 2016. ^ "SpaceX Achieves Orbital Bullseye With Inaugural Flight of Falcon 9 Rocket: A major win for NASA's plan to use commercial rockets for astronaut transport". SpaceX. 7 June 2010. Archived from the original on 17 June 2011. Retrieved 9 June 2010. ^ "Private space capsule's maiden voyage ends with a splash". BBC News. 8 December 2010. Retrieved 16 November 2011. ^ "STS-133: SpaceX's DragonEye set for late installation on Discovery". NASASpaceflight.com. 19 July 2010. Retrieved 24 April 2013. ^ "NASA Statements On FAA Granting Reentry License To SpaceX" (Press release). 22 November 2010. Retrieved 24 April 2013. ^ Ray, Justin (9 December 2011). "SpaceX demo flights merged as launch date targeted". Tonbridge, Kent, United Kingdom: Spaceflight Now. Archived from the original on 9 December 2011. Retrieved 9 December 2011. ^ "ISS welcomes SpaceX Dragon". Wired. 25 May 2012. Retrieved 13 September 2012. ^ "SpaceX's Dragon already achieving key milestones following Falcon 9 ride". NASASpaceflight.com. 22 May 2012. Retrieved 23 May 2012. ^ "NASA ISS On-Orbit Status 22 May 2012". NASA via SpaceRef.com. 22 May 2012. Retrieved 23 May 2012. ^ Pierrot Durand (28 May 2012). "Cargo Aboard Dragon Spacecraft to Be Unloaded On May 28". French Tribune. ^ a b "Splashdown for SpaceX Dragon spacecraft". BBC. 31 May 2012. ^ "SpaceX Dragon Capsule opens new era". Reuters via BusinessTech.co.za. 28 May 2012. Retrieved 27 April 2013. ^ "NASA Administrator Announces New Commercial Crew And Cargo Milestones". NASA. 23 August 2012. Retrieved 4 September 2012. ^ a b "SpaceX capsule returns with safe landing in Pacific". BBC. 28 October 2012. Retrieved 23 December 2012. ^ Clark, Stephen. "Cargo manifest for SpaceX's 11th resupply mission to the space station – Spaceflight Now". Retrieved 3 June 2017. ^ "The Neutron star Interior Composition ExploreR Mission". NASA. Retrieved 26 February 2016. Previously scheduled for a December 2016 launch on SpaceX-12, NICER will now fly to the International Space Station with two other payloads on SpaceX Commercial Resupply Services (CRS)-11, in the Dragon vehicle's unpressurized Trunk. ^ Foust, Jeff (14 October 2016). "SpaceX to reuse Dragon capsules on cargo missions". SpaceNews. Retrieved 11 November 2017. ^ Gebhardt, Chris (28 May 2017). "SpaceX static fires CRS-11 Falcon 9 Sunday ahead of ISS mission". NASASpaceFlight.com. Retrieved 30 May 2017. ^ "SpaceX's CRS-11 Dragon captured by Station for a second time – NASASpaceFlight.com". www.nasaspaceflight.com. ^ Bergin, Chris; Gebhardt, Chris (13 January 2018). "SpaceX's CRS-13 Dragon returns home". NASASpaceFlight.com. Retrieved 14 January 2018. ^ "SpaceX – Commercial Crew Development (CCDEV)" (video). 19 June 2015. 3:48. Retrieved 19 August 2016. ^ "NASA expects a gap in commercial crew funding". Spaceflightnow.com. 11 October 2010. Retrieved 28 February 2011. ^ "This Week in Space interview with Elon Musk". Spaceflight Now. 24 January 2010. ^ "Elon Musk's SpaceX presentation to the Augustine panel". YouTube. June 2009. Retrieved 27 April 2013. ^ Rosenberg, Zach (30 March 2012). "Boeing details bid to win NASA shuttle replacement". FlightGlobal. Retrieved 15 April 2012. ^ "Commercial Crew Integrated Capability". NASA. 23 January 2012. Retrieved 25 January 2012. ^ Clark, Stephen (11 October 2010). "NASA expects a gap in commercial crew funding". Spaceflightnow. Retrieved 12 April 2012. ^ Chow, Denise (18 April 2011). "Private Spaceship Builders Split Nearly $270 Million in NASA Funds". Space.com. Retrieved 12 April 2012. ^ "Space Act Agreement No.NNK11MS04S between NASA and SpaceX for CCDev 2" (PDF). NASA. 18 April 2011. Archived from the original (PDF) on 12 June 2012. Retrieved 15 April 2012. ^ Paur, Jason (27 October 2011). "SpaceX Launch Abort System Receives Preliminary Approval". Wired. San Francisco. Archived from the original on 18 December 2011. Retrieved 28 October 2011. ^ "CCDev 2 Milestone Schedule" (PDF). NASA. 16 February 2012. Retrieved 14 April 2012. ^ "ISS Update: SpaceX Space Act Agreement Status". NASA. 23 March 2012. Retrieved 14 April 2012. ^ "SpaceX Tests New ‘Super’ Rocket Engines". Wired. 1 February 2012. ^ "Boeing, SpaceX and Sierra Nevada Win CCiCAP Awards" Archived 4 January 2013 at Archive.today. Spacenews.com. 3 August 2012. ^ Messier, Doug (17 January 2014). "NASA Commercial Crew Partner SpaceX Tests Dragon Parachute System". Parabolic Arc. Retrieved 21 January 2014. ^ a b c d "NASA Commercial Crew Partner SpaceX Tests Dragon Parachute System". NASA. 17 January 2014. Retrieved 21 January 2014. ^ a b "SpaceX Demonstrates Astronaut Escape System for Crew Dragon Spacecraft". NASA. 6 May 2015. Retrieved 7 May 2015. ^ a b c d e Clark, Stephen (6 May 2015). "SpaceX crew capsule completes dramatic abort test". Spaceflight Now. Retrieved 7 May 2015. ^ a b Foust, Jeff (6 May 2015). "SpaceX Successfully Tests Dragon Abort System". SpaceNews. Retrieved 7 May 2015. ^ a b c d Bergin, Chris (6 May 2015). "Dragon 2 conducts Pad Abort leap in key SpaceX test". NASASpaceFlight. Retrieved 7 May 2015. ^ Musk, Elon (6 May 2015). "Twitter Post". Retrieved 7 May 2015. ^ "Space Act Agreement NO. NNK12MSO2S between NASA and SpaceX For CCiCap". NASA/SpaceX. 24 July 2012. Archived from the original on 16 December 2012. Retrieved 4 August 2012. ^ "Crew Dragon successfully conducts debut docking with the ISS – NASASpaceFlight.com". Retrieved 6 March 2019. ^ Bergin, Chris (18 March 2015). "Commercial crew demo missions manifested for Dragon 2 and CST-100". NASASpaceFlight. Retrieved 7 May 2015. ^ Foust, Jeff (4 February 2016). "SpaceX seeks to accelerate Falcon 9 production and launch rates this year". SpaceNews. Retrieved 21 March 2016. ^ Chow, Denise (8 December 2010). "Q & A with SpaceX CEO Elon Musk: Master of Private Space Dragons". Space.com. New York. Archived from the original on 18 December 2011. Retrieved 31 May 2012. ^ "Fibersim helps SpaceX manufacture composite parts for Dragon spacecraft". ReinforcedPlastics.com. 15 June 2012. Retrieved 11 January 2013. ^ "Production at SpaceX". SpaceX. 24 September 2013. Retrieved 29 September 2013. ^ a b c "Dragon Overview". SpaceX. Retrieved 16 April 2012. ^ a b Clark, Stephen (16 July 2010). "Second Falcon 9 rocket begins arriving at the Cape". Spaceflight Now. Retrieved 16 July 2010. ^ a b "SpaceX Updates — December 10, 2007". SpaceX. 10 December 2007. Retrieved 11 December 2007. ^ "Second Falcon 9 rocket begins arriving at the Cape". Spaceflight Now. 16 July 2010. Retrieved 4 February 2013. ^ "SpaceX CRS-2 Dragon return timeline". Spaceflightnow. 26 March 2013. Retrieved 13 April 2013. The unpressurized trunk section of the Dragon spacecraft separates. The trunk is designed to burn up on re-entry, while the pressurized capsule returns to Earth intact. ^ Jones, Thomas D. (December 2006). "Tech Watch — Resident Astronaut". Popular Mechanics. 183 (12): 31. ISSN 0032-4558. ^ "SpaceX • COTS Flight 1 Press Kit" (PDF). SpaceX. 6 December 2010. Archived from the original (PDF) on 15 April 2012. Retrieved 29 April 2012. ^ Bergin, Chris (12 April 2012). "ISS translates robotic assets in preparation to greet SpaceX's Dragon". NASASpaceflight.com. Retrieved 15 April 2012. ^ "NASA Advisory Council Space Operations Committee" (PDF). NASA. July 2010. Retrieved 15 April 2012. ^ "The ISS CRS contract (signed 23 December 2008)"
^ a b Bergin, Chris (19 October 2012). "Dragon enjoying ISS stay, despite minor issues – Falcon 9 investigation begins". NASASpaceflight.com. Retrieved 21 October 2012. CRS-2 will debut the use of Dragon’s Trunk section, capable of delivering unpressurized cargo, prior to the payload being removed by the ISS’ robotic assets after berthing. ^ "Launch Manifest". Hawthorne, California: SpaceX. 2011. Archived from the original on 20 November 2014. Retrieved 11 December 2014. ^ "Launch Manifest". SpaceX. 11 December 2014. Retrieved 11 December 2014. ^ Bergin, Chris (16 September 2014). "Dream Chaser misses out on CCtCAP – Dragon and CST-100 win through". NASA SpaceFlight. Retrieved 15 January 2016. ^ a b Wall, Mike (10 September 2015). "'Red Dragon' Mars Sample-Return Mission Could Launch by 2022". Space.com. Retrieved 20 September 2015. ^ @SpaceX (27 April 2016). "Planning to send Dragon to Mars as soon as 2018. Red Dragons will inform overall Mars architecture, details to come" (Tweet) – via Twitter. ^ Newmann, Dava. "Exploring Together". NASA Official Blog. Retrieved 27 April 2016. ^ Berger, Eric (19 July 2017). "SpaceX appears to have pulled the plug on its Red Dragon plans". Ars Technica. arstechnica.com. Retrieved 21 July 2017. ^ Wall, Mike (31 July 2011). "'Red Dragon' Mission Mulled as Cheap Search for Mars Life". Space.com. Retrieved 1 May 2012. ^ "NASA ADVISORY COUNCIL (NAC) – Science Committee Report" (PDF). NASA Ames Research Center. 1 November 2011. Archived from the original (PDF) on 20 January 2013. Retrieved 1 May 2012. ^ "SpaceX Launches Success with Falcon 9/Dragon Flight". NASA. 9 December 2010. Retrieved 11 April 2012. ^ Kennedy Space Center Visitor Complex [@ExploreSpaceKSC] (14 December 2016). "Same Dragon as displayed here in Feb 2015 from the C2+ or COTS Demo Flight 2 mission" (Tweet). Retrieved 6 April 2018 – via Twitter. ^ "Falcon 9 Drops Orbcomm Satellite in Wrong Orbit". Aviation Week. 8 October 2012. Archived from the original on 6 October 2012. Retrieved 9 October 2012. ^ "Private Spacecraft to Launch Space Station Cargo On Oct. 7". LiveScience. 25 September 2012. ^ a b c "Dragon Spacecraft Glitch Was 'Frightening,' SpaceX Chief Elon Musk Says". Space.com. 1 March 2013. Retrieved 2 March 2013. ^ "Dragon Mission Report". Spaceflight Now. Retrieved 15 November 2012. ^ "NASA says SpaceX Dragon is safe to dock with the International Space Station on Sunday". The Verge. 2 March 2013. Retrieved 2 March 2013. ^ "SpaceX hits snag; Dragon capsule won't dock with space station on schedule". WKMG TV. 1 March 2013. Retrieved 1 March 2013. ^ "SpaceX Dragon cargo ship splashes into Pacific". Boston Globe. 26 March 2013. Retrieved 28 March 2013. ^ "Range Realigns – SpaceX CRS-3 mission targets April 14". NASASpaceflight.com. 4 April 2014. Retrieved 4 April 2014. ^ "CRS-3 Update". new.livestream.com. Archived from the original on 26 April 2014. ^ "[SpaceX] Launch of SpaceX's Dragon CRS-3 Spacecraft on Falcon 9v1.1 Rocket". SpaceVids.tv. 18 April 2014. Retrieved 18 April 2014. ^ a b "Spaceflight Now Tracking Station". spaceflightnow.com. Retrieved 8 August 2014. ^ "SpaceX Dragon Flying Mice in Space & More for NASA". Space.com. 18 September 2014. Retrieved 18 October 2014. ^ "Space X Dragon capsule returns to Earth – CRS-4 Mission ends with a splash!". ^ "LAUNCH OF SPACEX'S CRS-5 MISSION SLIPS TO DEC. 16, IMAGES OF LANDING 'BARGE' EMERGE". Spaceflight Insider. Retrieved 22 November 2014. ^ "Spaceflight Now Launch Schedule". spaceflightnow.com. Retrieved 5 February 2015. ^ Bergin, Chris (27 July 2015). "Saving Spaceship Dragon – Software to provide contingency chute deploy". NASASpaceFlight.com. Retrieved 6 April 2018. ^ Cooper, Ben. "Rocket Launch Viewing Guide for Cape Canaveral – Atlas 5, Delta 4 & Falcon 9". Retrieved 6 February 2016. ^ "Dragon Splashdown" (Press release). SpaceX. 11 May 2016. ^ "Worldwide Launch Schedule". SpaceflightNow. Retrieved 20 June 2016. ^ Garcia, Mark. "Dragon Launches to Station, Arrives Wednesday". ^ Clark, Stephen. "SpaceX's Dragon supply carrier wraps up 10th mission to space station". Spaceflight Now. Retrieved 19 March 2017. ^ Etherington, Darrell (3 July 2017). "SpaceX's first re-flown Dragon capsule successfully returns to Earth". Tech Crunch. Retrieved 3 July 2017. ^ a b Graham, William (14 December 2017). "Flight proven Falcon 9 launches previously flown Dragon to ISS". NASASpaceFlight.com. Retrieved 15 January 2018. ^ Cooper, Ben (2 April 2018). "Rocket Launch Viewing Guide for Cape Canaveral". Launchphotography.com. Retrieved 4 April 2018. ^ Clark, Stephen (3 August 2018). "SpaceX cargo capsule comes back to Earth from space station". Spaceflight Now. Retrieved 30 August 2018. ^ "SpaceX CRS-16 Dragon Resupply Mission" (PDF). SpaceX. December 2018. ^ a b Lewin, Sarah (5 December 2018). "SpaceX Launches Dragon Cargo Ship to Space Station, But Misses Rocket Landing". Space.com. Retrieved 7 February 2019. ^ Bergin, Chris (14 January 2019). "CRS-16 Dragon returns to Earth following ISS departure". NASA SpaceflightNow. Retrieved 7 February 2019. ^ a b c Pietrobon, Steven (21 April 2019). "United States Commercial ELV Launch Manifest". Retrieved 21 April 2019. ^ "International Space Station Calendar". Spaceflight 101. 2 April 2018. Retrieved 6 April 2018. Wikimedia Commons has media related to Dragon (spacecraft). "SpaceX Reveals Its New Dragon Space Capsule". Slate. 30 May 2014.